Have you ever seen pictures of teeth with nicotine and tar stains? That’s what smoking does to your teeth, but it doesn’t stop there. Smoking is detrimental to your health in a variety of ways and that includes your oral health. Consider this, your sucking toxins straight into your mouth. Sure your cigarette has a small filter, but how much do you suppose that protects you? Today, your Livonia, MI dentist, Dr. James Stewart, discusses what smoking does to your oral health. In the U.S., 1 in 5 deaths each year are due to smoking. Life expectancy is 10 years shorter for smokers compared to non-smokers. It’s estimated that smoking accounts for 75 percent of adult periodontal disease. 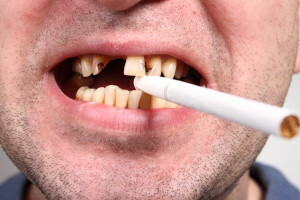 As you can see smoking doesn’t only affect your looks by staining your teeth, it affects your overall health and increases your risk of periodontal disease which can lead to tooth loss. Smokers report a higher incidence of oral health problems including periodontitis, tooth loss, and edentulism (the loss of all your teeth). Smoking suppresses the body’s immune system. Therefore, those who smoke have a harder time fighting off infection. The cause of periodontal disease is the development of sticky plaque which hardens, resulting in infection of the gingival tissue. The act of smoking itself contributes to the buildup of sticky plaque as tar and nicotine residue are also collected on the teeth. When irritation and infection ensue, the smoker’s system has a more difficult time combating it. This accounts for the high number of smokers who develop periodontal disease as well as accounting for the severity of the disease among smokers. Smoking also limits the growth of blood vessels, which slow the healing of damaged gum tissue. Smokers are also at higher risk for alveolar deterioration.